This bedroom and bathroom are essentially one open space. The headboard divides the room into its two functions, supporting the vanity on the other side. The suite has no associated dressing room a collection of white boxes and rails to hang clothes provide all the required storage. While most of us enjoy the advantages of open-plan kitchen and living areas, we may still be hesitant about going down the same track for our bedrooms and bathrooms. But that wasn't a concern for the owners of the master suite shown here. The suite is on the upper floor of a contemporary tropical home by architect John Bulcock. And, as with the house itself, the clients were happy to push the design boundaries, especially when it came to degrees of transparency and openness. 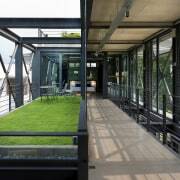 "It's connected spatially and visually to the rest of the house," says Bulcock. "You can see it from the ground level when you enter, and you can look down from it to the rest of the house." This double basin vanity is cantilevered off the bedhead in this master suite, with two double-sided mirrors suspended above. This openness also applies to the design of the suite itself, which forgoes the usual division of bedroom, bathroom and closet/dressing room. "From the start, the client didn't want to have enclosed spaces, but just wanted everything in the open," says Bulcock. Most unusually, this applies to the way clothes are stored. Instead of a separate dressing room or walk-in wardrobe, storage is provided by an orderly display of white boxes on double wooden shelves that run along the length of one wall of the suite. A set of shelves to the side of this bathroom have been used to create a convenient study area. The shelves are attached to the room's steel column supports, and bars running between them allow for clothes to be hung up too though the owners are currently not using them for this purpose. Plus one set of shelves on the opposite wall is used as a study area. By combining the headboard with the vanity as a freestanding unit, the design maintains the open feel, while still giving a sense of visual division between the bedroom and bathroom areas. 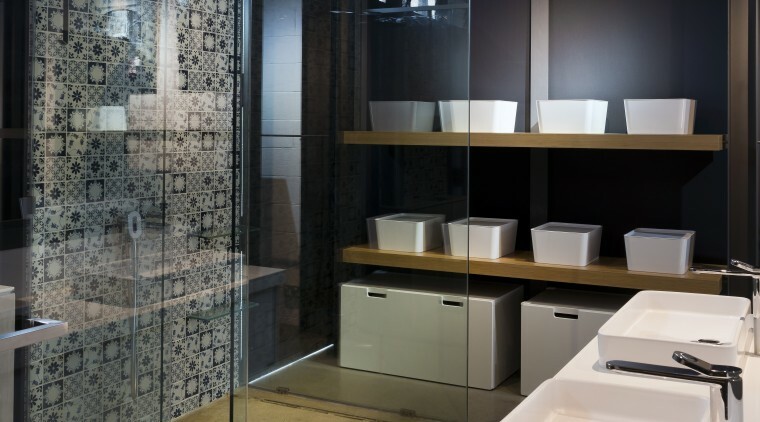 Meanwhile, the toilet and shower are enclosed within a glass box and accessed through two sliding glass panels.